You might think I’m crazy spending $22,000 on a truffle pig. Crazy like fox! Do you know how much truffles cost an ounce? They are not called “black diamonds” for nothing! Napoleon III had a 150 carat truffle mounted in platinum as a gift for the Empress Eugénie! 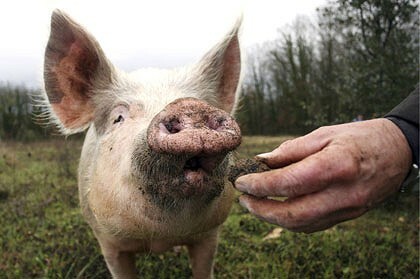 I read about this truffle pig farm located in Périgord in a back issue of The New Yorker… these pigs have the uncanny ability to shnuffle about in the under brush near oak and hazelnut trees, and dig up with their snout a treasure trove of these “turd” like objects. When a prize winning pig became available, I couldn’t resist! Visions of recipes made me drool! Thoughts of re-sale value of truffles danced like sugar plums in my dreams! Maybe I could even give up my day job? Luckily for me Desdemona (although someone suggested the name “Pancetta”, I ruled it out because it lacked class) was trained not to eat truffles. She is content to eat pastries. She can make a box of linzer tortes disappear before your eyes! She also adores raisin scones, cannolis, hamontashen (ironic, no? ), baklava and stollen. Her favorite is maple syrup glazed donuts stuffed with bacon (even more ironic!). Desi is also known to knock off a steak and kidney pie and a large Pepe’s white clam pizza. I discounted the idea of shlepping around the countryside looking for stands of oak and hazelnut trees. I decided to go right to the source. My contacts informed me that Stew Leonard Jr. just took delivery of mini-van filled with truffles for his extended family’s use. No worries there… I’m taking Desi over to the Norwalk Stew Leonard’s on Saturday… I’m just a little worried about getting her past the baked goods department. Once past, we’ll just blend in with the rest of the shoppers, and I’ll let Desi do her thing! Hah-hoo! I figure once we clean out Stew’s we can head into the City and hit Dean & Deluca! You bet! By Sunday my investment will be covered, and I will begin to harvest dividends! Still think I’m crazy? And when Desi has outlived her usefulness? Well…do I need to draw you a map?